Tutti Caringal of Protein Shake, Kean Cipriano of Callalily and Ney Dimaculangan of 6CycleMind collaborated for the song “Kaya Mo” which is the theme song of the 2010 Metro Manila Filmfest entry RPG Metanoia. 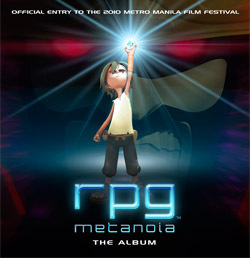 RPG Metanoia is something every Filipinos would be proud of. It is Philippine's first 3D animated movie. Judging from the RPG Metanoia movie trailer, the quality of the 3D animation can be compared to that of Walt Disney and Pixar's animated films like Toy Story and Shrek. The RPG Metanoia 3D movie is a proof that Filipino animators can do what their international counterparts can, and even greater. It is a proof that our talents are world-class.